There is a big enough list of mobile app monetization ways to consider. In this article, though, we would like to pay a very special attention to what is called in-app billing integration. 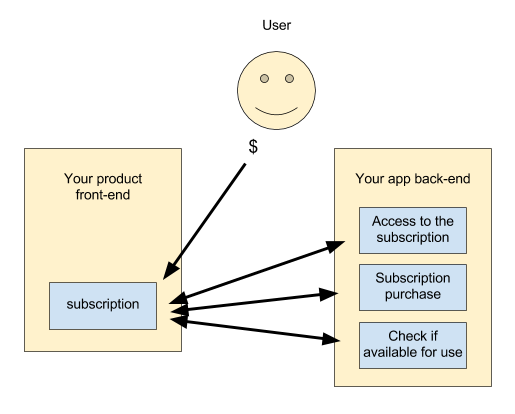 Here we share with you our expertise and the code examples on how to implement an in-app subscription mechanism for iOS (and partly for Android). Hope this short iOS in-app purchase tech tutorial will serve you great for your mobile marketplace platform development. Being one of the most recognized mobile app monetization methods, in-app billing functionality requires great attention to the tech details to make it effective in use. Performance is the core: there lies the answer whether the mobile marketplace platform will be viral or not. > your tech side of the app is responsible for checking if the user has subscribed and grants the access to the features offered after the subscription purchase. Later, in this article, we will describe the scheme in the form of code. Since we’ve dealt with the development of an app for AppStore, we would like to describe what were the ups and downs of the process, you might find useful. Developer’s account, where you point out the type of your product a customer can buy via your app. Here also you fill in all the required information about your app. Technical implementation (or simply, the tech stack for your in-app purchase functionality which is compatible with the technologies the app is based on). In our case, it’s Cordova, Meteor and React-based app. If you offer to purchase your own product, you can’t use any other online payment services integration apart from the one, offered by Apple (means no PayPal, Stripe, etc.). But in case with the transactions from user to user, it’s allowed. AppStore withdraws 15% of the fee based on your net revenue a customer brought you by subscribing to your mobile marketplace platform app. Apple offers its own price ranges to choose from (you can’t enter it manually). The description of the services is declared by Apple too. It might get quite unusual for some product owners, since the required info for AppStore might contain commercial details. To debug or test the product, you have to create a separate test account which is verified with the app’s ID. If this test account is anyhow changed it gets immediately deactivated. Each product has its unique ID number by which you can identify your app. There are 2 types of IDs: Team ID which is generated by Apple and Bundle ID - specified by you. From all said above, it might seem that Apple makes everything great for the end user but the developer tools are not flexible enough. If you're into the mobile app development, you might be interested in reading about the React Native Limitations and Best Practices to Deal With Them. 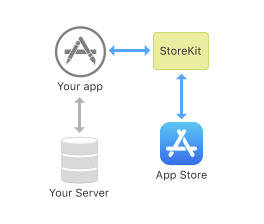 To make IAP’s work possible, your mobile marketplace platform should communicate with StoreKit framework. Consider this element as the secured payments passage, that is responsible for payments secure authorization and processing. But how to make all of this work together? Let’s explore it further in In-app purchase programming guide. Volture2 in-app-purchase (iap) package for the server. For Apple receipts validation we’ve used Apple’s Receipt Validation Programming Guide. Every time a user triggers some kind of a state change to any product, we perform specific actions. Below we define how the store will validate the purchase. What’s happening on the server side? We hope that the enlighted aspects of this iOS in-app purchase short tutorial will help you in your project’s endeavours, since the code is the heart of it all. If you’ve got a plan on how to implement well-thought mobile app monetization methods but you’re looking for team to bring your B2B and B2C marketplace development plans to life, you can surely call us for help.